If you want to find some really vivid stories about ordinary ancient Romans – not just about the toffs, the generals, and the emperors – some of the very best places to look are their tombstones. These give some amazing insights into the lives of real Romans – not those right at the very bottom of the social heap (people down there couldn’t afford a memorial) but those not all that far from the bottom. OK, the epitaphs are written in Latin – but it’s often very easy Latin. And even if you don’t know a single word of the language, you can get quite a lot out of them with only a very little help. In the BBC Two series Meet the Romans, we have looked at some really memorable – and quirky – epitaphs. I’m particularly keen on one ex-slave woman we came across: Allia Potestas, who lived in a ménage à trois with her two lovers (she was always the first up and the last to bed of the trio, we’re told – do things ever change?). But my other favourites were poor little Doris, who died in a terrible fire, and a splendidly pushy baker called Eurysaces, who didn’t only tell you what his job was, but even had his tomb built in the shape of a baker’s oven. 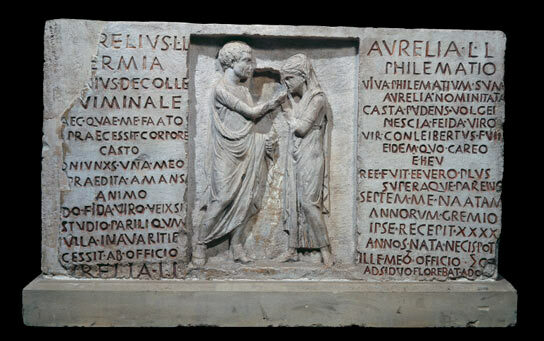 It’s a tombstone from Rome (first century BCE) of a husband and wife pictured in the middle. He (on the left) is called Aurelius Hermia and she (on the right) is called Aurelia Philematio (or Philematium, as it’s written a bit further down). They are both ex-slaves, who have at some point been given their freedom. How do we know that? Well right in the middle of both their names are two give-away letters “ L. L” – short for “Lucii libertus” or “Lucii liberta”, that is, “the ex-slave man or ex-slave woman of a man called Lucius”. One of the most extraordinary facts is that well over half the tombstones discovered from the city commemorate ex-slaves, and most of them are instantly recognizable with the letter “L” or more often the abbreviation “Lib” in their names. Romans owned hundreds of thousands of slaves, but also freed loads of them. Slavery in Rome wasn’t always a life-sentence. Anyway, the husband takes the left. This side is more battered (as you can see, even a bit of the name has been lost). But we can still work out that he was a “lanius de colle Viminale”, “a butcher from the Viminal hill”, one of the seven hills of Rome. (The word “lanius” is missing its first couple of letters… but if we had, in English, the phrase “…tcher from the Viminal hill”, we’d have little doubt what it meant!). He goes on to explain that his wife had predeceased him (you can spot the word “praecessit”), and of course that she had always lived devoted to him, as he was devoted to her (that is, she “stood by her man”, “fida viro” on the fifth line from the bottom). That, I guess, is a cliché even of epitaphs today. I don’t think we have to imagine that there was literally never a cross word between this pair. It’s the woman’s side on the right, though, where things get really curious. It starts off with some fairly conventional praise for a Roman woman. She was “casta, pudens, volgei nescia”, that’s “chaste, modest and unknown to the crowd” – she was “not gossiped about” would perhaps be a better translation. But after that it starts to get intriguing, if not downright odd. The husband, we are told, “was more than a parent” to the wife (you can spot the word “parens” seven lines up). They had met when she was just seven years old (“septem me naatam annorurum”) and he took her on his lap (“gremio”), and she died when she was 40 (“XXXX”) – meanwhile her husband had flourished under her dutiful care (“meo officio”). Hang on, we think. He took her on his lap when she was just seven years old? What exactly was Hermia up to with little Philematio on his knee? When precisely did they get married? Of course we don’t – and can’t – know. But explanations tend to fall into two broad camps. Explanation A. Some people imagine that when this pair had been slaves, the older Hermia had looked after the little girl, just like a dad… and maybe years later when both had been freed by their master Lucius, they married. This was a slave friendship that grew into free married union. Explanation B. Other people take a rather more dismal view of the partnership. They point out that Roman girls often got married much earlier than we do. In Meet the Romans we find one 12 year old, dying just before her wedding day. Even seven years old is not absolutely unheard of. So forget all those romantic notions of a kindly Hermia innocently befriending the young Philematio in the slave quarters. Slave or free, he had probably marked her out (at least) as his partner at the tender age of seven. I hope Explanation A is the right one. But we certainly can’t be sure. The dutiful, chaste and modest Philematio may have been, quite literally, a child bride.